Bell housing / Block bolt hole patterm? I've found a few posts asking for this, and one that had an un-finished DXF of the dimensions, but has anyone verified the accuracy of the dimensions? I'm tempted to use a bell housing off a ZF autobox (as it has an identifiable bore concentric to the centre-line of the crank), clock it in on my mill and the DRO to generate X-Y dims of the bellhousing bolt pattern as a reference. And of course, If I do this, I'll get it uploaded so everyone has the benefit of it. Reason I'm asking this, is I am looking for a very cheap (read free) way of modifying a mustang T5 bell / trans to mate to the RV8. Re: Bell housing / Block bolt hole patterm? 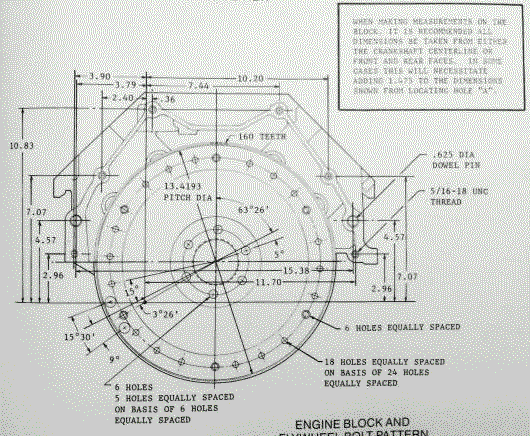 BOPC bell pattern, begins in 1964 for Buick small blocks. The Borg Warner 35 also has a round hole to mount the box. Nope, that is the 64 on pattern. The RV8 is the 61-63 Buick / olds / Pontiac (BOP) 215 cubic inch pattern - and the even rarer 198ci V6 pattern. Just as well, because I can’t tell what the heck is going on with that drawing! Where are they referencing the dimensions from??? The TH 180 as fitted to the SD1 has a separate bell housing too - and much shorter. Stay away from the ZF for 4x4 application bellhousings, they are a lot longer.